The bustling city of Cairo, historic and striking in sights and sounds, served as a backdrop for the Positive Life Alternatives for Egyptian Youth at-Risk of Irregular Migration conference—a forum sponsored by USAID and the UN International Organization of Migration (IOM) and facilitated by Legacy International. The training sessions addressed the topics of hospitality, marketing, and tourism management, and were led by top professors in the fields of business, hospitality, and marketing from the Virginia Tech Office of International Research, Education, and Development (OIRED), the Virginia Tech (VT) Pamplin College of Business, and Entwine Digital. 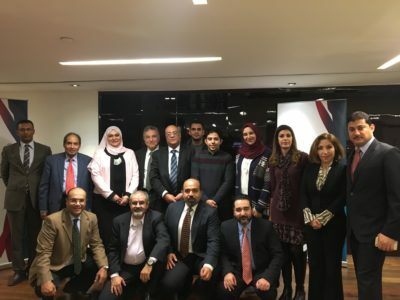 Representatives from the Egyptian public and private tourism sectors, the Ministry of Tourism and individuals from hotels and travel agencies attended the training. The professors covered a vast array of topics, including but not limited to: digital Darwinism, holistic marketing dimensions, social media, design thinking, relationship marketing, teambuilding, ecotourism, and e-commerce marketing and advertising concepts. Dr. Parviz Ghandforoush, Associate Dean at the VT Pamplin College of Business, opened up his first day by discussing the impact of social media. “Social media is nothing more than creating a community—a community that is trusting itself.” Dr. Ira Kaufman from Entwine Digital began his session with the idea of being agents of change in the customer experience by posing the question, “If we are all together on the same page, what kind of power could we have? People are going to communicate a positive customer experience. You must create urgency.” Dr. Mahmood Khan from VT Pamplin College of Business embellished his portion of the training with engaging personal anecdotes and discussed holistic marketing dimensions. “Tourism is a service, it is not a product. Relationship marketing is very important. We want our customer to come back again, and again, and again.” Dr. Khaled Hassouna, from OIRED, led the last day of the workshop and facilitated a teambuilding, ecotourism exercise. 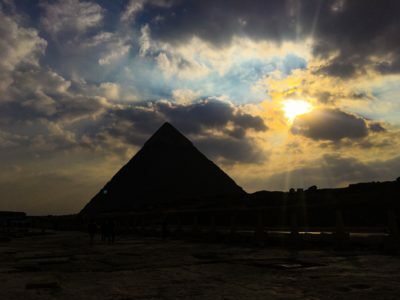 It was all hands on deck as the participants took the lead, brainstorming an environmentally sustainable, traditional, resort experience to draw more tourism to Egypt. At the culmination of the 5-day conference, the overarching feeling among all the participants was gratitude for the opportunity to work so closely with individuals from different sectors within Egypt. This team of excellence, gathered by Legacy International from Virginia Tech and Entwine Digital, compiled a stellar and comprehensive training, well received by the attendees, as well as the representatives from IOM. 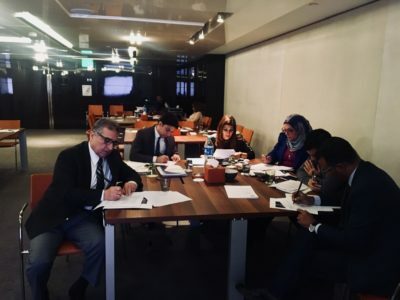 Having received such in-depth coaching left the attendees brainstorming new ways to implement information gleaned from the sessions into their own offices and sectors. Ashraf Ibrahim, the HR Manager from the Egyptian Tourism Federation shared that digital marketing and design thinking need to be effectuated in the activities of the Egyptian Tourism Federation. Riham, the assistant to the Minister of Tourism, expressed how the sessions provided her with more information about the importance of the role of technology in the travel and tourism industry and how to efficiently and effectively harness technology to improve tourism. Ahmed Talaat, tourism specialist and technical member in the Ministry of Tourism summed up his experience by saying, “I’m very to happy to [have] attended this workshop. It is very effective and I learned a lot of recent techniques in digital marketing. Nowadays, digital marketing is considered one of the most important and effective [methods] in marketing.” Because of the training and information received, Talaat shared that he would be rescheduling his marketing strategy in the Ministry of Tourism in order to incorporate more of the knowledge he gained from the experience.